During the design phase for PermaBlitz #3 the PermaBlitz design team recommended a wicking bed system for the Host. This particular type of system would efficiently utilize their well water to irrigate annual vegetable plants in their fenced edible garden. A wicking bed is a self-watering garden bed. The water, held in a reservoir at the bottom of the bed, moves upward by capillary action to water the plants in the soil above. It is estimated that this type of system can save anywhere from 40-90% of water used. Before PermaBlitz #3 took place the Host constructed an outdoor sink using an old cast iron sink. A three-way valve in the plumbing was installed so that water, which may not be suitable for vegetables in the wicking bed can be diverted to the mulch basin. The sink was placed just outside the fenced garden and will be used to rinse vegetables from the garden and rinse pots from the fabric dying process (the Host works with natural dyes, specifically their abundant Toyon shrub). The Host also built the frame for the wicking bed, lined it with (NSF 61 rated) EPDM pond liner and installed the necessary plumbing parts for the wicking bed to function. This all happened before the ‘Blitz to save a lot of time -if this hadn’t happened, the entire ‘Blitz would have been just this project! The aesthetic of the bed also matches the rest of existing garden beds in the fenced garden. During PermaBlitz #3 participants filled the new bed with a layer of smooth rock, then a layer of landscape cloth to prevent the rock from interacting with the next layer of perlite. One more layer of landscape fabric was laid down then planting soil was added to the top. To test the system the reservoir was filled with water and everyone eagerly watched the overflow pipe slowly leak water to the (future) asparagus bed… just as designed! 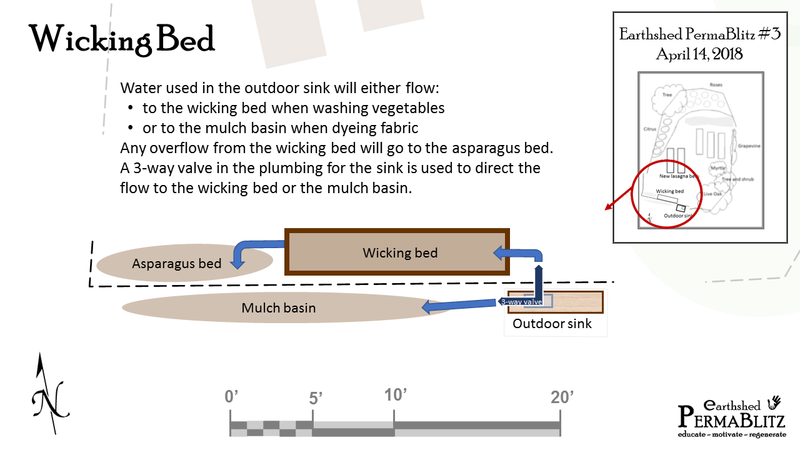 By utilizing the water three times: washing vegetables, watering the plants in the wicking bed and watering the asparagus bed, the designers made sure appropriate connections were made. Placing the wicking bed, outdoor sink and garden elements in proximity to each other we are applying the permaculture design principle ‘Integrate Rather than Segregate‘ -placing elements so they assist each other. In order for there to be beneficial connections between different parts of the system, it is important to place them in relative location to each other. As permaculture designers we help arrange our landscapes to maximize energy capture. In this case we are catching the energy of water and storing it in the reservoir of the wicking bed so that it can do useful work for us when growing food. This is the principle of Catch & Store Energy. The use of water is low and highly efficient to grow food. There is no water waste in the wicking bed system so another principle is being applied, ‘Produce No Waste’. Waste is an unused output. Permaculture aims to connect inputs and outputs so that different elements meet each other’s needs. Careful maintenance and investing in good quality long lasting products will also help reduce waste and overall consumption levels. As Bill Mollison says: “The yield of a system is theoretically unlimited, or, limited only by the information and imagination of the designer.” In this case the Host will Obtain a Yield; well, several yields – healthy annual vegetables from the wicking bed, delicious perennial asparagus from the asparagus bed, a space to efficiently use their well water to grow some of their food and the entire set up is beautiful -which is another important yield! Outdoor sink and wicking bed -plumbed and ready to plant. The end of Bill’s quote on connections is, “Permaculture makes the connection, because as soon as you’ve got the connection, you can feed the chicken from the tree.“, or in this case, water several garden beds from used sink water and eat the results! We look forward to posting photos of this system in action in the months to come! Our next PermaBlitz (#4!) will be in October but before that happens we’ll host 2 Pre-Blitz Gatherings via the Chico Permaculture Guild in August and September. The Pre-Blitz Gatherings are good way to get more involved in the PermaBlitz itself by learning about how we go through the process of working with our Host, detailing out the application of permaculture principles and how the design itself comes together for the ‘Blitz. These events also count toward becoming a Host yourself! We are also currently accepting applications to our new Intern Program for PermaBlitz #4 in October. You can fill out the application here on our website, directly in Google Forms or download a paper copy to snail mail or scan and email it to us at permablitz@earthshed.org. The deadline for turning in an application is June 1st, 2018. While we will be taking a break over the summer from our regular events we will still be preparing for the Fall events to come. Stay tuned for more details about the fun hands-on learning opportunities we’ve had with the Earthshed PermaBlitz. For more info about wicking beds check out the front runners of this method, VEG Wicking Beds out of Australia. ← Earthshed Blog -hey, this is new!